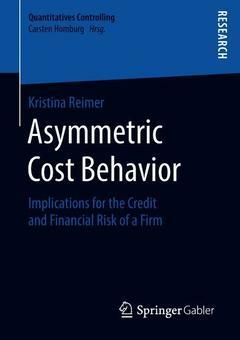 The thesis of Kristina Reimer provides a comprehensive analysis of asymmetric cost behavior (also known as cost stickiness) by discussing its origin and development in the theoretical and empirical research from the 1920s of the past century up until today. Further, using an empirical approach, she investigates the implications of asymmetric cost behavior for credit and financial risk of a firm. In addition, she provides an introduction into credit risk fundamentals by focusing on credit default swaps. Thereby she analyses the development of credit default swap market as well as the components of credit spreads. Finally, she provides several suggestions for future research. The concept of cost stickiness.- Foundations of credit risk fundamentals and methods of determining credit risk.- Credit default swaps.- Does cost stickiness affect credit or financial risk? Dr. Kristina Reimer received her doctoral degree at the University of Cologne. Her supervisor was Prof. Dr. Carsten Homburg from the Department of Management Accounting.